If you are receiving this mail in error or you want to remove yourself from future mailings, please to send your request to kmorris at odpem.org.jm with "Removal Request" as the subject. After a long absence on my part - the time and weather has decided that it is again time to report from the northern town of Ocho Rios. As many of you probably know by now, Ochi suffered some unbelievable weather Wed night into the early hours of Thurs morning. The end result - the main street of town ended up under mud. In some places the mud is well over 18 inches thick. Main Street was closed for business yesterday and again today - insurance assessors are everywhere and shop owners are trying to salvage what they can and figure out how they are going to open for business. Banks, supermarkets, KFC, Burger King, Post Office, gas stations, you name it, if it is on Main Street, it a'int open. In all the years I have lived in this area, I have never seen anything like it. In talking with the old timers yesterday - they repeated the same sentiments. Many of the communities to the south of the town have been badly affected, as has Milford Road, the road leading from Fern Gully to the town. BUT, we are resilient, we had a ship in harbour yesterday - I had the Village open for business and we had a wonderful time with the passengers. They were extremely interested in what had happened and how the community comes together to assist. Local business owners began directing traffic from 3am, others trying to clear mud away from the drains - and so it went on. Once the mud has dried, we will dust off and right back at it again. We had very little rain in this area since the beginning of the year until this week, I also was in the process of replacing the waterproofing on one of our large buildings - we had this project about 60% complete when the rains started. Well, we now know why they make 55 gallon plastic rubbish bins - they are for catching water !! The busy winter season is winding down which of course means that June is fast approaching and we all know what means - time to get the stocking up lists ready. I really am going to get a generator this year - think I said that last year and look where we are again. - 2008 Atlantic Basin Seasonal Hurricane Forecast released today at Bahams weather conference. Today is the start of the 12th annual Bahamas Weather conference (April 9-12th) at the Westin Grand Bahama Island . This year the conference will attract 100 television meteorologists from the U.S., Canada, and Europe.The Weather Channel and CBC Newsworld in Canada will broadcast highlights of the conference across North America. Today William Gray and Phil Klotzbach of the Colorado State University Hurricane Forecast Team issue their updated forecast for the 2008 hurricane season as part of the opening of the Bahamas Weather Conference .They are forecasting an above average hurricane season. Partly cloudy to fair skies across the island. Lately, The weather has been really nice, since it we picked up some rain on Saturday evening.Total precip on Saturday...0.5in/12.7mm. The weather looks wonderful for the next 7 days,So enjoy it!!! April 9 (Bloomberg) -- Hurricane forecasters probably will boost the number of expected 2008 Atlantic storms when they update their prediction for the season today, meteorologists say. William Gray and Philip Klotzbach of Colorado State University, whose predictions are closely watched by insurers, energy markets and local governments, are scheduled to release their forecast by 11:30 a.m. New York time. Their preliminary report in December predicted 13 named storms this year, including seven hurricanes, three of them major. Schlacter predicted the team at CSU's Tropical Meteorology Project would forecast two additional hurricanes, one of them major, for the season that begins in June and runs to the end of November. Gray and Klotzbach have offered a preview of hurricane seasons for almost a quarter-century and typically fine-tune them at this time of year. Natural-gas traders will watch for any hurricanes forecast in the northern Gulf of Mexico, where gas wells are concentrated. ``There's very little cushion if the gulf is hit,'' said Chris Jarvis, president at Caprock Risk Management LLC in Hampton Falls, New Hampshire, which advises energy producers and industrial users. Inventories of natural gas are at a two-year low after a cooler winter than the year before. Also pushing supplies lower is higher demand from industrial users, who are choosing it over more expensive fuel oil. Last year, two Category 5 hurricanes -- the most intense on a five-tier scale -- made landfall in the Atlantic Basin for the first time ever. Storms Dean and Felix narrowly missed gas and oil rigs in the gulf, plowing into Mexican and Nicaraguan agricultural regions. Boosting the odds of Atlantic hurricanes is the current La Nina weather pattern, which occurs every three to five years. The phenomenon cools Pacific waters while also calming atmospheric turbulence. Turbulence normally discourages hurricane formation over the Atlantic. ``The chances for the continental U.S. and the Caribbean Islands to experience a hurricane increase substantially during La Nina,'' according to the National Weather Service's Climate Prediction Center. Gray and Klotzbach aren't always accurate in their predictions. They issued identical forecasts for the 2006 and 2007 seasons -- 17 named storms, with nine strengthening into hurricanes. In 2006, there were 10 actual storms, five of them building into hurricanes; in 2007, there were 15 storms, six of them hurricanes. In 2005, they forecast 13 storms, including seven hurricanes. The season produced a record 28 storms that generated 15 hurricanes, including Katrina and Rita. The five-tier Saffir-Simpson scale defines major hurricanes as having winds of more than 111 miles (179 kilometers) an hour. A tropical storm becomes a hurricane if its winds reach 75 mph. Hurricane Felix struck northeastern Nicaragua with winds of about 160 mph on Sept. 4. The death toll was as high as 130, according to the National Hurricane Center in Miami. Hurricane Dean battered Central America's Yucatan Peninsula on Aug. 21 with 165-mph winds after killing as many as 40 people across the Caribbean. - Trough weakening High Pressure Ridge to build across the region. Yesterday, Montego Bay experienced thunderstorm and rain. The rain and occasional thunder started at around 5:15 and continued up unto 7pm. Today we aslo saw some much welcomed rainfall. It started sometime after two pm and tapered off with the hour. Total precipitation for the past 24hrs is 0.92 inches/23.4mm. Forecast features a nice balance. We had rain this week and now to the sunshine which visitors travel from thousands of miles to see and enjoy. The trough which has provided the island with rain throughout the week is forecast to weekend as a high pressure ridge builds across the Caribbean. Saturday-Tuesday looks fair with the best chance of rain through the period on Saturday night. - Trough cuts across the Island. Nice weather here, free healthcare program running okay with a few minor glitches. The talk of the nation is the dramatic developments coming out of the USA. Most people are shocked at the news, which broke yesterday; of a Jamaican detained at a Florida airport after bomb parts were found in his luggage. You can read more about that story by clicking the link. Nationwide radio (link below) typically has news and coverage of local stories between 6a.m-10a.m (est.). and 6-10pm (est.). Finally waves are expected be high again for our friends in the Eastern Caribbean. NWC/NCEP 24HR Wind and Wave Forecast below. rainfall amounts of 5-10mm with maxima of 15-35mm through Wednesday. rainfall, but that’s for another time. (That prospect is discussed in the HPC Discussions  below). I will not be able to blog as frequently as I have been doing lately, but I will try to pitch in when possible. The today's weather is really nice . 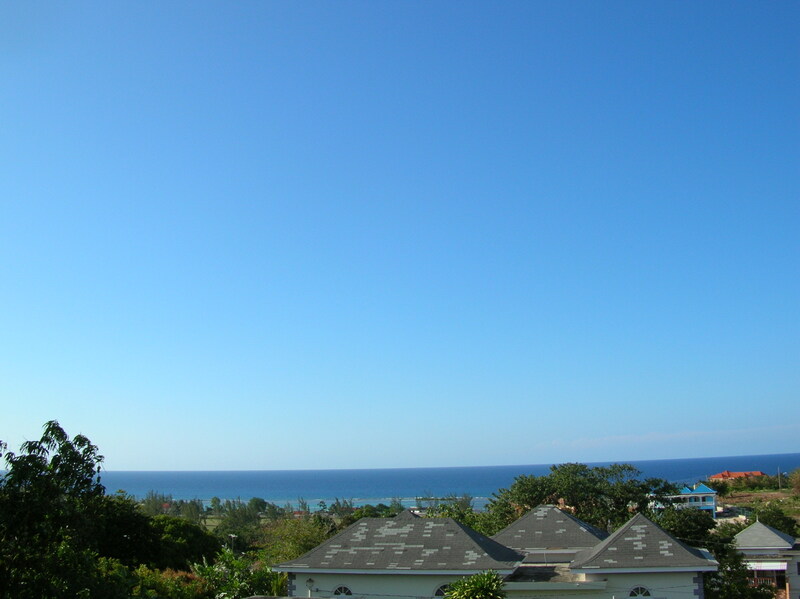 Sunny,(temperature 28 deg celsius) cloudy free skies with light winds(10kts).I took a picture from my roof at 5:45pm/6:45pm est (below).April is typically a month of incresed moisture across the the region.In Montego Bay, we typically see an increase from March's 5 days , 27 mm of rainfall, to April's 7 day's of rainfall totaling 57mm.This can be attributted to the increases in temperatures .We typically see from the March 's average high of 28.9 deg celsius to April's to 29.5 deg celsius. The warmer temperatures and moist atmosphere trigger convectional rainfall. The ground and seas is warmed by the sun, throughout the day. The air above the land becomes heated. This makes the air less dense, so it rises. As the air rises it cools. Cool air can not hold as much water vapour as warmer air, when the air becomes too cold for the amount of water it holds condensation occurs. The point where this occurs is called the dew point. These drops of condensation form into clouds, gradually becoming tall thunderstorm clouds, called cumulonimbus. When these clouds become too big, containing too much water gravity forces them to release the water in a huge downpour. source(bbc gcse Geography). attached: The picture I took from my roof today. Mostly cloudy skies across much of the island today as subsidence is in firm control across muc of the region.We are expecting more great weather until Tuesday/Wednesday. When a cold front will move in the area. Well everybody is talking about the free healthcare for all Jamaica to take effect in 72 hrs. Some people are saying,"It is impossible, we cannot afford it", "It will be a strain on our health system! , we dont have enough health personnel" ,"They are going to kill us with tax". While others are saying ,"It is definetly possible, It is a step in acheiving first world status", "Government promised free tution for all and we get it with no problem,so what the difference here". Well, we will have to wait for 72 more hours to have an idea, but the debate goes on . below is full story on this issue from Radio Jamaica. The Ministry of Health has said all is in place for the April One abolition of user fees at health care facilities. At a press conference held on Friday to outline provisions made for the new regime, Health Minister Ruddy Spencer sought to cover all concerns related to the April One changes. Mr. Spencer assured the audience that free health care was not an April Fool's Day trick as he explained how the new health care regime will work. "I want to assure you that April One is not Tom Fool's Day. Come April One we are removing that barrier and Jamaicans will be able to access that care free of cost," said Mr. Spencer. "We have already disbursed $60 million to the regions. We have also retained a certain amount to assist with the purchasing of some critical items that we will need so that when they descend upon these facilities we will have things in place,"
He professed his confidence in the new system saying all players in the health sector were consulted in the lead up to the change. Targeting critics of his administration's move to transform health care, Mr. Spencer revealed several strategies implemented to address inadequacies in the sector. "One of the things our critics keep saying is that we can't afford it. It is not possible to do it, they are rolling it out on April One because they know what kind of day that is,"
"Let me assist you in enlightening the public, that all the records that I have looked at there is no year where we have been able to collect more than 15 per cent of that total cost. In other words the 85 per cent had to be found somewhere else, picked up by the government. So essentially what we are picking up is the 15 per cent that we used to collect," he continued. On the matter of equipment, Mr. Spencer assured that $40 million has been earmarked for the purchasing of small equipment such as stethoscopes, examination lamps, autoclaves and nebulisers. He added that provision is also being made to enhance the physical plants of some facilities. The ticklish issue of the shortage of doctors and nurses was seen by the minister as a work in progress. Mr. Spencer said long term plans have been put in place to recruit foreign and local health care workers. However he said the new system will for now have to operate with its current staff complement. Mr. Spencer said in order to deal with what the Ministry expects to be a 30 per cent increase in patients accessing public health care, opening hours for these facilities will be extended and health care providers will work overtime. Under the new system registration, doctor's examination fees, hospital stay, drugs, surgeries, renal dialysis, ante-natal care and radiation treatment are just some of the services that will be free. And some workers in health care facilities will be re-deployed other duties as the new regime takes effect. The Health Minister told RJR News that these workers including cashiers will be deployed to other areas of the Ministry. The cashiers will no longer be needed as there will be no collection of fees for services at clinics and public hospitals. Have a good day. Below the skyline of our beautiful capital city, Kingston. We managed to squeeze some rain out the stationary front before it wilted. In the morning hours, we received some moderate rainfall in total 0.66in/13.7mm. Seems a little, but it is better than nothing. There is still a change for very light rainfall as there is a trough in the area which sustains a moist pattern across much of the basin. It should persist for the next 3 days and daily widely scattered amounts of 0-5mm daily with Maxima 10-15mm likely. It should be however sunny for the most part. This summer, a fleet of small unmanned aircraft, similar to radio-controlled models sold by hobby stores, is to be launched into the heart of hurricanes to beam back information that may sharpen the accuracy of tropical forecasts, scientists say. But the satellite-linked drones likely won't be permitted to conduct reconnaissance missions into storms that approach the U.S. coastline, the upshot of a bureaucratic tiff between two federal agencies. The Federal Aviation Administration has refused to authorize the planes, called Aerosondes, to fly near the U.S. mainland or adjacent international waters, saying they could endanger planes fleeing a hurricane. The National Oceanic and Atmospheric Administration wants to deploy the 30-pound drones from coastal Virginia or Key West and argues they would operate far from normal air routes. Until the two agencies come to an agreement, NOAA plans to launch the winged probes from Jamaica or Barbados during the 2008 hurricane season into storms that pose an initial threat to the Caribbean. Missions flown from those tropical islands still would allow scientists to hone the Aerosonde program, which will be conducted on an experimental basis, said Joseph Cione, NOAA's principal investigator for unmanned aerial system research. "The endgame is to improve forecasts and save lives and property," he said. Although Aerosondes have been flying into storms, exploring arctic regions and undertaking other scientific missions for about seven years, NOAA wants to step up their use this year. Scientists hope the drones will provide new clues about the still-mysterious cores of hurricanes — and specifically, the process that allows them to strengthen. Manufactured by Aerosonde, based in Melbourne, Australia, the propeller-driven weather probes, which cost more than $50,000 each, are engineering marvels. Equipped with a 1.6-horsepower engine and flight management computer, the drone can fly an astonishing 2,300 miles on 1.5 gallons of fuel at a cruising speed of about 60 mph. With such stamina, the drones can be directed into a hurricane and drift in its swirling winds for more than 20 hours. After enduring the turbulence, they are rugged enough to return to their home base intact. Though Aerosondes might be considered the cousins of military drones, they aren't nearly as big or powerful. The U.S. Air Force Predator, for instance, weighs up to 2,250 pounds, is equipped with a 115-horsepower engine and can be armed with laser-guided missiles. By flying as low as 300 feet above the ocean, an altitude far too dangerous for manned aircraft, the Aerosondes can transmit temperature, wind, barometric pressure and humidity readings from that important slice of the atmosphere to the National Hurricane Center, said Cione, who is based in Miami. No other technology is available to obtain such key information instantaneously, the NOAA official said. After feeding the data into forecast models, the hurricane center should be able to better determine a storm's structure and warn which areas of Florida and other at-risk states stand to be hit hardest. Aerosondes already have demonstrated a tenacious ability to examine storms. One flew for 17.5 hours in Hurricane Noel last November and another for 10 hours in Hurricane Ophelia in September 2005. The planes provided a better understanding of how thermal energy is transferred from the warm ocean to the storm above it, Cione said. "If we don't understand that, we will never have really accurate forecasts, so it's a critical region," he said. From the FAA's point of view, the problem with the drone is that when a hurricane approaches, residents in cars aren't the only ones who flee.In Florida alone, thousands of airplanes and helicopters belonging to airlines, flight schools, private individuals and the U.S. military also would retreat, FAA spokeswoman Kathleen Bergen said. "We want to be sure that the unmanned aerial system operations can be done safely without impacting any of those aircraft that are evacuating — or the hurricane hunters," she said. The FAA does intend to issue NOAA and its partner in the Aerosonde program, NASA, permission to fly the small planes, Bergen said. But she said that would be with restrictions and would come too late to affect flights during the 2008 hurricane season, which starts June 1 and lasts six months. Anson Franklin, NOAA spokesman, said his agency will continue to "work closely" with the FAA to find a way to eventually operate the drones from U.S. bases. "We will still be able to find some ways to continue testing the unmanned aerial system without running afoul of any regulations," he said. The Aerosondes are part of a broader NOAA program to use unmanned aircraft to monitor global events, such as arctic ice melting, volcanic lava flows and changes in fish and whale populations. NOAA recently invested an additional $3 million in its overall unmanned aircraft program. Aerosondes already have flown more than 1,000 hours in the Arctic yet are so flexible that they also can fly in baking Sahara heat, said Daniel Fowler, a drone operator with the Aerosonde firm. He said the plane is constructed with tough polymers, such as those used in bulletproof vests, and other advanced materials. Fowler said the probe is normally launched from the back of a moving vehicle via radio controls, like many model airplanes. Then control is transferred to satellite, with an operator in a mission command post taking charge. "Once on satellite, the operator can be anywhere on the face of the planet, talking to the plane," he said. In the future, Aerosondes might help forecasters better anticipate when tropical systems might rapidly intensify, a phenomenon that until now has been hard to foresee, said Chris Landsea, science and operations officer at the National Hurricane Center. He said the drones might also help determine the size of storms, information that would help emergency managers better plan for evacuations. Links shows the original story and a actual video of how the process works. - Stationary front across the island. Mostly cloudy skies and a few periods of very light showers observed today. All thanks to a stationary front extending from a low over Honduras.The front as been over the island since early this morning .It has been producing very scattered, hit and miss showers. Just checking out some observations, both internatonal airport reported light rainfall throughout today, but not see any precip reports. The stationary front will dissipate by tommorow (Thursday) , but hopefully we can squezze some rain out of it for our farming areas in southern Jamaica .They have been hit hard with drought and bush fires.An additional 5-10mm and maxima of 15-25mm are expected from through the next 36hrs. Learn more about the weather through these learning modules. Throughout today's blog I have highlighted a few good caribbean weather links for all the avid weather enthusiasts . Tommorrow is the opening of Parliament in Jamaica. Many persons will be watching to hear about the budget. It will be the first time in 18 years, the JLP will presenting as incumbent. Have a good day.Below is today sea-surface temperatures .Folks its getting warm.Remember ocean waters have to be 26.5 deg Celsius for hurricanes to form. A nice weather day with partly cloudy skies for much of the day . This changed as the day progressed, dark clouds began streaming from the northwest, and very light rain showers occurred. and rainfall is expected for the next 48hrs. At 18z the cold front was located from Belize-Western Cuba-Northern Bahamas extending from a developing low off the southeast coast of the US. This front will be across the island tomorrow (Tuesday) then move east towards Haiti on Wednesday. Accumulation of 5-10mm daily are expected. Below March 24 00utc gfs model run?.24hrs surface. Nice weather here in Jamaica, but I had to blog this morning out of extreme concern for the islands. A dangerous weather situation is developing. This will affect our neighbors in the Eastern Caribbean, from Puerto Rico in the North, to St. Vincent and Trinidad in the south. Once large, powerful and lingering North Atlantic Ocean low pressure area is and will continue to generate extreme swells. These will reach the islands in the today and Friday. Marine conditions will continue to deteriorate throughout the morning, with swells in the region of 13-14 feet. On Friday waves will continue to be high 12-13 feet but will die down to 9-10 feet Saturday. Some areas in the period could see swells in excess of 15 feet! There are buoys east of Martinique right now reporting 13ft waves. Coastal flooding is possible especially in northern and eastern sections of islands facing the Atlantic Ocean. I strongly urge residents and tourists to avoid the beaches during the period, as dangerous rip currents pose a possible threat. Small craft operators should stay put until winds and seas die down. In fact, I would recommend that mariners secure their vessels against these waves as they could do serious damage. Persons should listen to bulletins issued by their local meteorological and emergency management services for more information. - We must be able to beat Barbados!!! Come on everyone! Sign up now! positive impact on climate change,no matter who we are or where we live. among the cities that will be involved. What can I do? Hour. Pledge to turn off your lights from 8-9 pm on Saturday, March 29, 2008.
stand against global warming<the greatest threat our planet has ever faced. The long-awaited Doppler weather radar, being installed by the Caribbean Meteorological Organization (CMO), is nearing completion at Brasso Venado in Trinidad and Tobago. This state-of-the-art project is funded by the European Union and will be completed within a few weeks. It will form part of the Caribbean Early Warning System for predicting and monitoring severe weather conditions. district of Tabaquite in the central range of Trinidad. Brasso Venado will be completed within weeks, after which a period of extensive testing will take place. of severe weather, such as approaching tropical storm and hurricanes, heavy rainfall events, etc. be able to ‘see’ approaching weather on the radars for themselves. As you are aware, the ODPEM will be staging the 5th annual National Disaster Management Conference (NDMC) from March 6-7, 2008. It will be held at the Rosehall Resort and Country Club in Montego Bay, St. James. This year’s Conference will address two very important areas of risk management and risk reduction: landslides and earthquakes. A major goal of NDMC 2008 is to enhance the efforts of the Office of Disaster Preparedness and Emergency Management (ODPEM) to continue to lead in facilitating the dialogue and action towards the shift from a response driven hazard management programme to an integrated risk management approach. Through a carefully designed programme, conference participants will share and examine information on landslide and earthquake risks, trends, emerging technologies, tools and innovations and best practices that can be employed to reduce the risk and vulnerability to these hazards. To this end we will be playing host to an eclectic mixture of participants who will be sharing, networking and learning from each other about these two major hazards to Jamaica and the wider Caribbean. To all those who will not be able to attend this year's Conference, you can contact us for copies of any presentations of interest to you. Thank you again for your continuing interest and partnership in the work of the ODPEM. Your coverage of and participation in this event is most anticipated. thougt might be of interest to persons . raindrops ,which evaporated almost immediately as they reached the ground. President Fidel Castro Republican candidate . attached a english translation for those interested. The source of the attached letter is Cuba's state newspaper The Granma. Google virtual earth and great satellite imagery. I will be able to blog often until late June . Plans are speeding ahead for the fifth staging of the ODPEM's annual National Disaster Management Conference (NDMC) 2008. We are still welcoming Abstracts for proposed presentations from all our NDC members, especially from those countries with specific experiences related to the theme of the Conference, Furthering the Risk Reduction Agenda - Landslides and Earthquakes, such as St. Lucia and the MOSSAIC Group, Grenada, St. Vincent, Montserrat and Dominica. We are expecting an exciting programme this year and look forward to welcoming you all to NDMC 2008 in Montego Bay, St. James, Jamaica. Your coverage of this event is most anticipated. The Week will be observed under the theme: "For Safety's Sake, Be Ready for the Next Earthquake!" Your attendance and coverage of this event is most anticipated. It is an overcast and very windy morning in Montego Bay and across much of Western and Central Jamaica. The strong cold front which brought snow flurries to Daytona Beach, Florida and Hurricane force winds to the Gulf of México and extreme Nwern Caribbean has moved through. The winds have been howling NNE at 21kts/24mph/39kph since the early morning hours and have not eased since. The smaller trees have been swaying and even the large branches of my East Indian mango tree are been tossed around by the strong winds. From my location I have a good view of the sea and it is very rough ,I can see plenty of foam and spray as the waves slam onto the coastline. Temperatures have so far reached the current maximum of 24 deg c /75 deg f, Yesterday this time it 29 deg c/84 deg F it might only be a 3 degree drop in temperature but that’s a lot in warm tropical Jamaica. In contrast, the Capital city Kingston has not yet experienced the Cold Front .It is currently 28 deg c and winds throughout the morning have been 3-5 kt range. The Cold Front will move through Kingston as well Eastern Jamaica shortly, it currently extends (based on 7 am noaa Caribbean Surface analysis ) from St. Mary to Clarendon moving slowly se .Even after the cold front is gone strong winds are expected to continue up to Tuesday. Today into tomorrow 30kt/35mph/56kp/h winds are possible even gusts to 35 kts/40mph/64 kph cannot be ruled out in higher elevations. SIGNIFICANT FEATURE… Strong Cold Front moving across the island. Morning… Mostly cloudy, windy and cool with occasional showers mainly over northern parishes. Afternoon…cloudy, windy and cool with occasional showers mainly over northern parishes. Night…cloudy, windy and cool with occasional showers mainly over northern parishes. Fri/Sat: Cloudy, cool and windy with scattered showers mainly across northern parishes. Sun: Partly cloudy with cool and windy conditions mainly across northern parishes. High Pressure Ridge behind the front to maintain strong winds through the weekend. Try to have a warm and nice day. Older reports from Jamaica have been moved to another page.